Can Dennis Rodman Fix Relations with North Korea? In a world where the truth is stranger than fiction, the fact that former NBA basketball player and generally bizarre guy, Dennis Rodman, is known to be somewhat close friends with the North Korean supreme leader, Kim Jung-un, should come as no surprise. 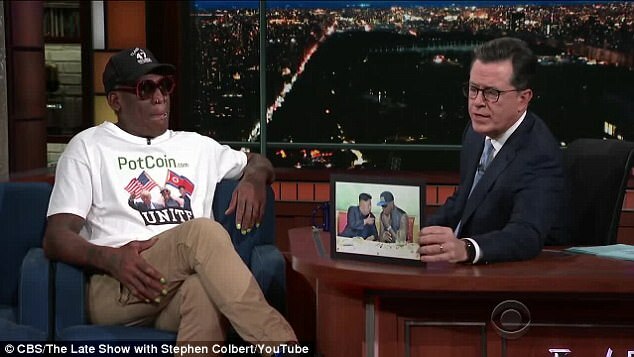 Dennis Rodman, 56, showed up on The Late Show with Stephen Colbert to talk about how things are between himself and the North Korean dictator. By the way, isn’t it funny how guests on that show take a backseat in comparison with the very creepy and mighty strange Stephen Colbert, making them seem like the most normal people on Earth? But, that’s probably a story for another time. Anyway, Rodman and Kim’s relationship was the focus of the segment, and in Dennis’ own words, he described Jung-un as “probably a madman, but I don’t see it”. Rodman also said that Kim Jung-un is more like “a kid” than anything else. A kid with nuclear weapons, that is. Rodman stipulated about his first time visiting North Korea to see Kim, who’s a big basketball fan: “When I went over there, the first thing he said to me was, ‘Mr. 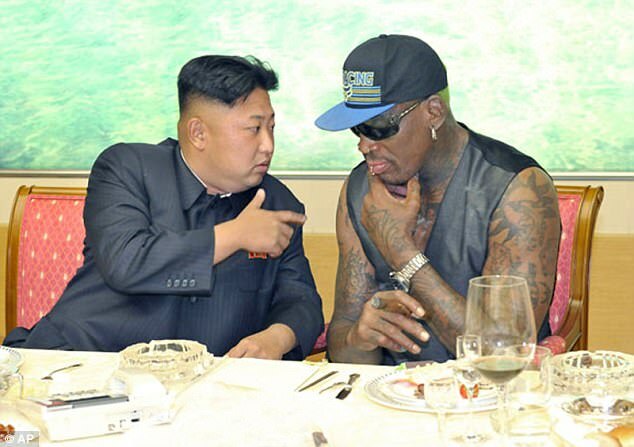 Rodman, we just want to know, can we trust you?’ I said, ‘Absolutely.’ And that’s how our conversation started”. Rodman elaborated on his friendship with Kim, saying “I don’t really judge people, you know, by their color. I don’t judge where they come from. I just judge people where, you know, we’re all human beings. You know, throughout the day, we’re all human beings. It’s funny though that I don’t see how people can sit there and say that this person is a ‘madman’. He probably is, but I didn’t see that. But he probably is”. Rodman stated that Kim “wants to change his culture” and that with each visit Rodman has made to meet Kim, the supreme leader has “changed so much for the people”. In one of Rodman’s five visits during 2013, Kim Jung-un said that he doesn’t want war, and that Dennis Rodman genuinely believes that he could help open the doors for more personal talks between Donald Trump and Kim Jung-un as a mediator, along with China who are also actively mediating with North Korea right now. Wouldn’t that be something? “I want to open the door so we have some communications” said Rodman. That would be great, however, Rodman had been told by US officials that “now was not a good time” for him to go to North Korea, as Dennis mentioned to The Guardian in a recent interview. Here’s hoping that he’ll be allowed to go to help ease tensions between America and North Korea sooner rather than later, just for the entertainment factor of it all. Sounds like a lot of fun to us! Perhaps the 2014 film ‘The Interview’s’ depiction of Kim Jung-un doesn’t seem too far off when in relation to the fun things that happen over at Kim’s place, even though it’s a comedy. “We ride horses, we hang out, we go skiing, we hardly ever talk politics and that’s the good thing about that. Every time I see him he’s always calm, he’s always smiling especially when he’s around family”. Does Dennis Rodman hold the key to appease any escalating problems with North Korea? Could Donald Trump administer the former power-forward Dennis Rodman as a special mediating weapon against North Korea to help make everyone friends again? Only time will tell, but it’s definitely something that we can all look forward to.